» How serious is the risk of contracting rabies from bats? Bats do not attack people. They may fly alarmingly near in pursuit of a mosquito, giving the appearance of swooping to attack. However, there is one disease carried by bats that may be transmitted to humans. A small number of bats, 6 in the last 15 years, have been found to carry a virus related to Rabies, European Bat Lyssavirus (EBLV), which comes in two varieties. Rabies is a viral infection that is transmitted to humans through a bite, or contact with membranes such as the eyes, nose or mouth. It travels up the nerves, eventually infecting the brain and is almost always fatal. The virus cannot enter through unbroken skin and infection is only therefore spread through contact. People in other European countries who have been bitten by bats and who have tested positive for EBLV, have been given post exposure treatment and none of them have developed the infection. The six bats that have been found to have been infected have all been Daubenton’s bats, and were infected with EBLV2. EBLV has not been found in pipistrelles or brown long eared bats, the bats most commonly found in buildings. It highly unlikely therefore that someone could be infected with EBLV, but good practice is to always wear gloves when handling bats. Should a bat fly into a property and need to be removed you should put on bite proof gloves. An alternative method of catching the bat would be to put a small box or margarine tub over the bat when it has landed. A thin sheet of card can then be slide under the box so that they bat is trapped inside. Alternatively a cloth can but put over the bat and used to hold the bat so it can be picked up. The bat can then be taken outside to be released from a sheltered spot such as a window sill or tree trunk, away from the reach of children, cats or dogs. 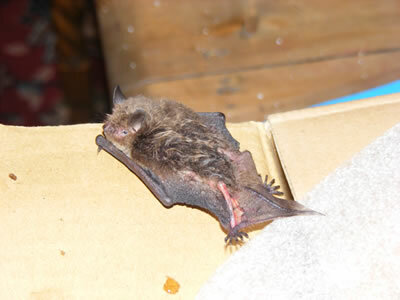 Should an injured bat be found it should be trapped as above and the Batline national number, 0845 1300 228, telephoned so that a registered bat worker can help deal with the bat. » How the Habitats Regulations 1994 affects bats.